When Chris Meloche was visiting from Canada a couple of years ago, and we were flicking through images on his new digital camera, I came across this sleeve which really stood out. Old enough to recall the rumblings of discontent when Tyrannosaurus Rex ditched hippydom and became T. Rex, I thought I knew all their sleeves. That though is a lot of the enjoyment of LP art; there’s always something new out there to be discovered. Back in Canada, where he’d picked this up, Chris sent me some more details. It’s a 1972 compilation, coupling two of the early Tyrannosaurus Rex albums, My People Were Fair… and Prophets , Seers and Sages. This kind of suggests what was going on. Band hit big time in UK, American record label spots two early albums which are musically very different but might tempt some of the newer fans, so quickly repackage said albums in a new cover. What teenies enthralled by Get It On thought when they heard the early acoustic material I don’t know, but the cover is amazing. The four illustrations which decorate the front, back and inner gatefold, were by Peter Bentley, an illustrator based in London, though as far as we know the album was only issued in America. Bentley was one of a three man design agency based in London, Bentley / Farrell / Burnett, which began circa 1969. Over the next couple of years they did a lot of smart work, much of it inspired by illustrations and typography from the 1930s, but with a contemporary edge. Penguin used them for book cover designs on reissues of a number of pre-war novels. Apparently the trio didn’t stay together too long, and as this cover is credited to Bentley solo, we must assume he was working freelance by then. The basic central image of a jester on the front centre is developed by using the jester’s hat shape, repeated across front and back, each time with a different set of shapes and colours. So hints of art deco, early sci-fi and underground comics, but all used in a very original way. A&M Records, the label set up in 1969 by trumpeter Herb Alpert, did move to pick up a number of British acts in the early seventies for North America and Canada. Art director Michael Doud was an American who moved to live and work in London in 1964, and became A&M’s creative director in December 1971. His credit crops up on many sleeves from 1972 onward including this one. 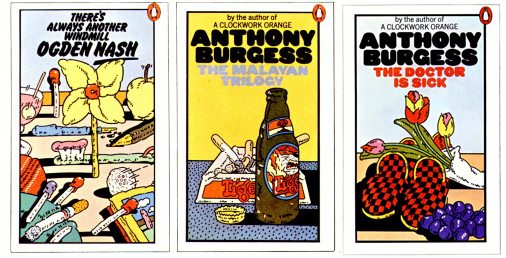 Bentley also did some more book covers work for Penguin that year, three illustrated here show his very distinctive style. Nobody is sure what happened to him later on, but according to one of the agency partners he was last heard of living in Greece. I’ve since found a sleeve done by another of the partnership for a Judith Durham album. Click the link to find out about that. Thanks so much for this article! I found two copies of penguin books with these illustrations on and was desperate to find out who designed them, seems you’ve already done the hard work. it seems a shame that they never made more work. I would love to see more maybe not in such a commercial context, like so many similar artists from this era. Thanks Lilith. I think most artists like this had little choice but to work in a commercial arena I suspect.